Place all of the rice ingredients in a heavy bottomed saucepan over high heat. Once it comes to a boil, cover the pan and turn the heat down to low. Cook until tender, about 15-20 minutes. You can also use 2 cups of leftover rice. 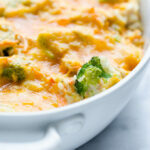 Mix together the rice, chicken, broccoli, carrots, sour cream, salt, pepper, and 2 cups of the cheese. Spread in a 13x9-inch baking dish. Sprinkle the remaining cheese on top. Bake in preheated oven until hot and the cheese is bubbly, about 30-35 minutes. Serve with butter.